Beyond LiteracyLink: Home is Where the Heart is! "By wisdom, a house is built, and through understanding, it is established. Through knowledge, its rooms are filled with rare and beautiful treasures." For the past month, I have been trying to declutter my house based on the wisdom of Marie Kondo, Japanese organizing consultant. I have started to look through shelves, closets, and attic to determine the worth of saved items. While doing so I linger in the memory attached to each object and then, make a decision on whether the piece still brings joy. If not, I place the item in a donation box or in the throwaway bin, letting go of any sense of loss I may have. How many times have I turned to faith, believing that the family foundation would withstand challenges? How many times have I relied on the bonding of hearts to bring joy back into the home again? Understanding that it is not the structure of a house that brings hearts together leads to the concept of home. 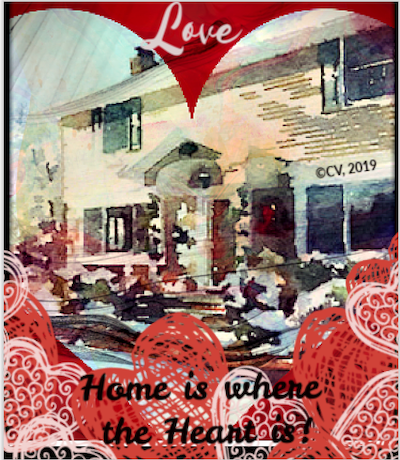 My home has been adorned with a tapestry of invisible love that filters the drama of the outside world and withstands the turmoil of inner struggles. It is my home not the house that becomes a sacred place of refuge and warmth, bringing hearts together and strengthening bonds. Do you feel the same way? is home where your heart is? Listen to Elvis sing his tender song, Home Is Where The Heart Is. 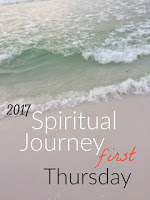 I now join this month's Spiritual Journey 1st Thursday's discussion with Donna Smith at Mainely Write. The above poem is my attempt to write a "skinny", a poem of eleven lines in the following format: The 1st and 11th lines can be any length. The 11th and last line must be repeated using the same words from the 1st line and opening line, however, they can be rearranged. The 2nd, 6th, and 10th lines must be identical. All the lines in this form, except for the 1st and last lines, must be comprised of only one word. Carol: I feel both ways... home is within the hearts of loved ones, but it can also be a place. But sometimes we live places where we never feel "at home." Home is a complicated concept, it seems like the more I struggle with it the more complicated it gets. Thanks for your poem and post, and best to you for a good month. Thanks, Karen for stopping by and providing me with your insights. Tonight, I am under the weather with a sinus infection so my husband and son set up dinner. When I got down we stopped for a prayer of blessing like we were talking about. Home is definitely where the heart is and as Elvis says anywhere you are. Lovely, Carol. For some reason your post reminds me of the book I'm reading, A Very Fine House: A Mother's Story of Love, Faith and Crystal Meth. It's a tragic story of the beautiful 20-something daughter of the author, who becomes addicted to crystal meth and how that addiction tarnishes everything, even their lovely home in Bend Oregon. It's such a contrast to your home, where you say: "My home has been adorned with a tapestry of invisible love that filters the drama of the outside world and withstands the turmoil of inner struggles." Without belief and faith, I can easily see how a home can become divided and not withstand the sands of time, Violet. There are so many pressures in the world that families need stay strong and home has to be a place of refuge and love. Thanks for sharing your thoughts with me. Thanks for this post! I love the "filtering the drama of the outside world." Ruth, when I am with my grandbaby, Sierra (like I am now for a couple of days), I feel it is so easy to filer the drama of the outside world and the turmoil of inner struggles. My daughter and son-in-law's house is another one that I can call home since one prevails. Life issues seem to fade away as Sierra is in my presence.